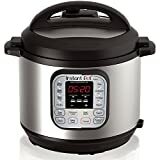 The Cuisinart EPC-1200PC Electric Pressure Cooker is the electric pressure cooker for you if you are looking for a new approach to that healthy lifestyle you’re vying for but can never seem to properly find a way to follow through with. The pressure cooking method alone is proven to be one of the healthiest ways of cooking – often using little to no oil, and despite the high pressure, meat cuts don’t lose moisture (even economical cuts) and vegetables lose neither their minerals, nutrients nor their vitamins – which means that you don’t have to resort to a raw diet in order to retain the numerous benefits from the vegetable/fruit group of the food pyramid and an apple a day will still keep the doctor away; especially with just a small dash of custard to help the medicine go down thanks to the Cuisinart EPC-1200PC. Owning the Cuisinart EPC-1200PC (see best price) means that you don’t have to compromise on the ingredients you like in order to adapt to that healthy lifestyle, you simply have to have a balance of ingredients and a health conscious method of cooking your food in the first place, and the Cuisinart EPC1200PC makes the latter very easy. The Cuisinart EPC-1200PC also reduces the cooking time for your meals by up to seventy percent when compared against other cooking methods and their respective cooking times, leaving you with more time to worry about what to wear when you go out instead of will using this pressure cooker make me late – it may be a rhetorical question but I’ll answer it anyway, no, no it won’t. So throw on your slickest sneakers or your happy hour heels and get ready to enjoy yourself, knowing that you still have plenty of time for a light dinner before you leave. With an array of cooking settings controlled by simple push button controls, a precision thermostat both of which are indicated by the easy to read LED digital display (brown, sauté, simmer, keep warm and pressure cook – both high AND low pressure) the Cuisinart EPC-1200PC really does spoil you for choice when you’re deciding what to eat – but in such a way that you don’t necessarily have to go raiding the fridge for something to make a dessert from, although you can very well do that, desserts come out tasting awesome from the Cuisinart EPC-1200PC, as does a healthy broccoli soup – you see the advantage to balance yet? 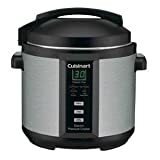 Having grown up with Cuisinart products I immediately knew that this was just the type of reputable brand I’d been looking for to go along with my new found (and thoroughly enjoyable) independence when I was looking around myself four years ago; products of excellent quality and all at a budget price – perfect! Thanks to the Cuisinart EPC-1200PC I can enjoy all of my favourite healthy foods; soups, stews, meat, rice, roasts, casseroles, and pudding… while never once losing the full bodied flavour of a dish, no matter how many times I pressure cook/sauté/simmer/brown or keep warm in the Cuisinart EPC-1200PC (the non-stick coating has yet to lose its value as well – it saves so much time as I’m not trying to manoeuvre a spatula while having to keep my arm away from the hot cooking pot of the pressure cooker as I don’t want to burn myself). With additional life-saving features such as a timer, automatic lid lock (it won’t open until the pressure has been dropped to a safe level), cool-touch handles (so that you’re not likely to scald yourself even when you’re as clumsy as I am), and non-stick coating on the cooking pot and trivet – not to mention the dishwasher safe practicality of both the ability to put the pressure cooker into the dishwasher saves so much time; not to mention, the Cuisinart EPC-1200PC is a great conserver of water – which is IDEAL when you’re making a conscious effort to drink more filtered water but you’re worrying about how it will affect your energy bills. Click here to read more Cuisinart EPC-1200PC customer reviews on Amazon.com..
Pressure Cooking Ability, the Cuisinart EPC-1200PC has a capacity for both high and low pressure cooking; decreasing the cooking time by up to seventy percent – allowing you to do a small amount of work from home – the small amount motivating you while you’re waiting for your dinner to finish cooking, making the most efficient use of your time. Push Button Controls, the push button controls enable the Cuisinart EPC-1200PC to function as a multi-cooker, using the precision thermostat to make minute changes to the temperature which in turn changes the program that the Cuisinart EPC-1200PC is set to, giving the electric pressure cooker the additional capabilities to brown, simmer, sauté and keep warm. Cool Touch Handles, one on either size for maximum balance and an even distribution of weight when lifting the cooking pot from off the trivet (and either taking it over to the sink or somewhere else to rest it so that you can serve out the meal) and the cool-touch property of the handles mean that you don’t have to worry about balancing the cooking pot awkwardly in a pair of oven gloves or a tea towel (meaning that you’re much less likely to drop it on the floor). It costs less than $90! All of these great features listed above and for a lower price than it costs to buy a majority of smart phones. The Cuisinart EPC-1200PC is a budget-range pressure cooker that is available on Amazon and other retailers for less than $100. No other pressure canner can offer such a fantastic price without compromising on cooking quality. We love it! Click here to see what other customers are saying about the Cuisinart EPC-1200PC.. If you’ve been looking for a machine to cook healthy food for you while you go out, so that you can find the best way – not just to have a healthy lifestyle, but also to appreciate and enjoy the freedom you have to live it, then look no further than the Cuisinart EPC-1200PC. Its multi-functionality means that, if you get fed up with one cooking method, there are still others to choose from, including some additional healthy cooking methods: simmer and warm. The Cuisinart EPC-1200PC has everything that you need to make successful and tasty meals again and again. In fact, Cuisinart have so much faith in their product that they extend a limited 3yr warranty with the EPC-1200PC. The Cuisinart EPC-1200PC is a superb pressure cooker that delivers on what it promises. While it might not be the best of the bunch, it is definitely a model worth considering if price and reliability are two things you care about. It is a wonderful pressure cooker. I am looking for a pot to replace the old and scratched one. Even with great care never use metal ware with it, the pot is still scratched. No complain here just looking for a spare one. Where should I look? Hi Dawn – I would check with Cuisinart…they may be able to help you. We’ve owned this Cuisinart pressure cooler for about 5 years, but have only used it occasionally (maybe 10 times) and it worked well. We recently decided to start using it a lot, so we pulled it out of storage, prepared food contents, set it to High Pressure and 15 minute cooking time, and turned it on. To our dismay, in about 5 minutes it switches to Warm without ever building up pressure. We read and reread the manual, checked that all the parts were correctly in place, and tired it 5 more times on both Low and High Pressure settings, with the same results. We even called Cuisinart and they walked us through several possibilities, all to no avail. So we have to conclude something is wrong with the electronic control panel – after just 10 uses. Very disappointing. Anyone else run into this problem?